Provide innovative quality products and services that empower customers/families to explore the outdoors while supporting active, healthy, and fun lifestyles for all ages, from toddlers to grandparents! Brian returned and opened his first recreational rental location in Ventura, California. He purchased a small quantity of regular 2-wheel bicycles to round out the rental fleet, but the real star was the Surrey cycle. Every customer (and family) left with a huge smile and a cherished memory. As time went on, others wanted to open similar Surrey rental locations in their hometowns, so a small distribution company was formed that sold Surrey cycles and the necessary replacement parts to keep them running. In 1999, Freetime Inc., doing business as Wheel Fun Rentals, was established when Brian McInerney combined forces with Al Stonehouse, former president of Diamondback Bicycles. By 2001 they were manufacturing their own Surrey built specifically for the rigors of the rental market. Shortly thereafter, they began manufacturing other unique cycles to add to the fleet and began franchising rental locations. Today, Wheel Fun Rentals has over 100 locations nationwide, with more than 2.5 million guests hopping on-and-off recreational products each year. Locations include city, state, and national parks, beaches, marinas, retail spots, hotels, visitor centers, and more. Wheel Fun Rentals’ specialties have expanded significantly since its inception. Our expertise and vast portfolio include: recreation rentals, boating, kayaking, water-bound adventures, Segway Tours, guided bike and kayak tours, food concessions, special events, resort amenity offerings, Safari Cycles, retail, fishing, bait & tackle, and so much more! Through this evolution, one thing has remained constant, Freetime Inc. aka Wheel Fun Rentals = recreation. We pride ourselves on being the best in recreation with the highest quality products, excellent customer service, superb hiring and training programs, and more. Bringing people together, helping provide outdoor exercise, and making a difference in people’s lives- it’s all part of being a good neighbor and community leader. Here are some of the programs we have in place. SUPPORT LOCAL YMCA, BOYS & GIRLS CLUBS, SCHOOLS, CHURCHES, SYNAGOGUES, SCOUT GROUPS AND OTHER COMMUNITY ASSOCIATIONS. 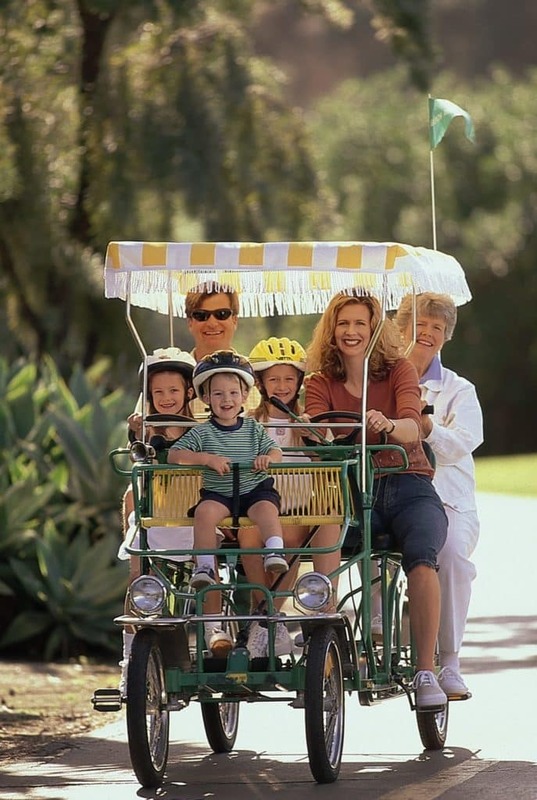 Wheel Fun Rentals offers a chance to rediscover the joys of having some old-fashioned fun. “Somewhere along the line most of us got off our bikes and into automobiles. Our purpose is to help you rediscover what you knew by heart as a kid – once you climbed on your beloved bike and headed through the mud puddles, you were really free and headed for fun. The Wheel Fun Rentals logo is reminiscent of a 1950’s family taking a ride and having fun. It was important for us to provide a bike that is lighter weight, has more stopping power, and has the smoothest shifting available on the market. Our Infinity Shifting Priority Bikes [found in San Francisco and Long Beach, CA] gives riders the confidence to get out and see their destination without the hassle of complicated gears or the potential of a chain falling off. The low maintenance features of these Infinity Shifting Bikes, available only at Wheel Fun Rentals, means a better experience for our riders. I just wanted to express my gratitude to Wheel Fun Rentals for providing Big Brothers Big Sisters free rentals. I was taking my “little sister” to the Chinese Festival in Military Park today and we were just thrilled to get a paddle boat ride! The canal is so fantastic and paddling down it on this magnificent day was an amazing experience. Thanks so much for making a memory! My Little is Margaret, she comes from a low-income family, was born with a cleft palate and had surgery last week for a skin graft on her eardrum. Thanks for helping me give this new 13yr old a great day!!! !